Masonic Ring, the all-telling sign of the Freemason. 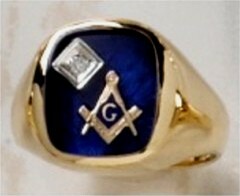 The Masonic Ring is the sign of Freemasons all over the world. Typically shown with the Compass and Square on the top of the Masonic Ring and the Plumb and Trowel on the sides of the shank of the Masonic Ring, the ring is normally worn on the third index finger next to the pinky finger on the right hand. There are several different opinions as to whether the points of the compass on the Masonic Ring should point toward or away from the wearer’s body. As of this date, the Grand Lodges have not made any rulings on this subject. Take one viewpoint for example. If you were to hang the American Flag, would you hang it with the stars at the bottom or top of the flag? Obviously you would fly the flag with the stars on top; therefore, the wearer of the Masonic Ring should wear the ring with the points of the compass and square pointing toward the wearer. Another viewpoint is that when the emblem of the Compass and square is displayed on a building or a pennant, the normal customer would be that the points of the compass would point downward. When displayed on the Altar, the points of the compass and square point away from the Master. As the Master from his station views the compass from the Altar of his lodge, the points are from, not towards him. As the wearer of a compass watch charm views it, the points are down and away from his eyes. In a similar way, as the Mason views the emblem on his Masonic Ring, the points should be down or away from his eyes. The square is the symbol of earthly things and the compass of heavenly perfection. As a combined emblem, the ends of the square point up as a symbol of man’s aspirations toward God; the points of the compass are down to represent heavenly qualities coming down from God to earth; therefore it would seem that the proper way to wear the Masonic Ring would be that is which its symbolism is best expressed; namely, that in which, when the hand is held in its usual position, the points of the compass of the Masonic Ring are towards the earth and away from the wearer’s eyes. « Who Was Prince Hall? This entry was posted on Tuesday, February 21st, 2012 at 11:18 am	and is filed under Freemasonry, Masonic Symbolism. You can follow any responses to this entry through the RSS 2.0 feed. You can leave a response, or trackback from your own site.